Forty-four years ago at 20:18 military time, humanity first landed on the Moon. Apollo 11 brought Neil Armstrong and Buzz Aldrin to the surface. Six hours later, Armstrong made that first step and uttered his immortal words. It was an exciting time back then. I remember listening and watching and wishing I could have been aboard with them. This post went up at the exact time Apollo 11 landed on the Moon. The tenth anniversary of a most horrible day is upon us and I just wanted to take a few moments to think about those who died in that awful mess. those directly killed and the brave souls who perished trying to save some of the victims. 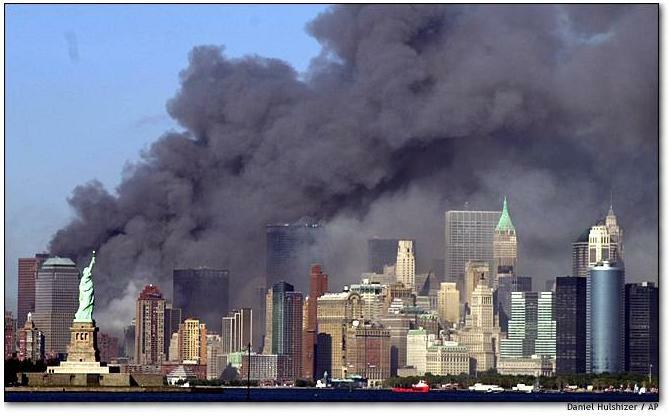 Something just shy of three thousand people died that day and a single greater tragedy has not hit this country. For a time, it brought this country together like nothing else ever had, though it did spawn some illogical things as well. I’m sure most of us remember it well. I had been out that morning taking care of business, returning home to get ready for work, headed in at eleven a.m., and turned the Tv on. At that time, they still weren’t sure what was happening. One tower had been hit by a plane and speculation was rampant. I don’t think anyone had mentioned terrorists at that point. I called the folks and asked them if they had the Tv on(they rarely turn it on for anything but the news). They didn’t and I told what I knew. I spent most of the time I had watching with growing fascination and then horror when the second plane flew into the other tower. By then, word was out about the plane hitting the Pentagon, the one that crashed because of the actions of the passengers, Flight 93(likely bound for the White House). At work, I learned that word was already spreading there(those cell phones). So SALUTE to those Americans, and others that were in the World Trade Towers that day and on the hijacked airliners, as well as those at the Pentagon. Their deaths will long be honored. 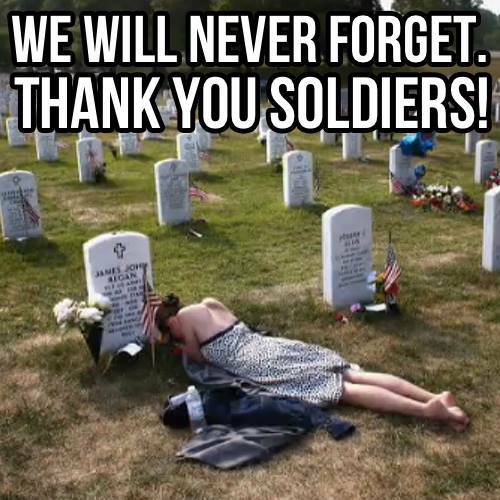 But no honor to those Americans that performed some of the idiocies in the next few days. The verbal abuse, the attacks on mosques and other religious buildings, the one murder of a Sikh shot to death in Arizona. I remember one over-the-road driver in to pick up a shipment at my place of work talking about incidents. A regular driver at our business, his wife and he were Native American. Because of the black hair and complexion, they got the muttered curses under the breath, the looks, when they were out and about. Nothing more Thank goodness. We should have been better than that. I had a discussion with one of that idiot persuasion railing about them “A-rabs” and he became incensed when I said he resembled a prominent American terrorist, Timothy McVeigh, blond hair and blue eyes. Should we treat everyone who looked like that with verbal abuse and assaults? Of course I was wasting my breath. That type never get it. I’ll be spending the morning thinking of those lost souls, then watch some football. I believe they would have wanted such. At least I hope so. I remember the chill those words brought to me this day in 1969. I was just a few months from my twentieth birthday. Science fiction had been a big part of my young life at that point, firing my imagination in all manner of ways. On this day, there was only the original Star Trek series, three years of a canceled show. A personal favorite, I was there for the very first broadcast. That and all the fiction I had read was coming to life before my very eyes. 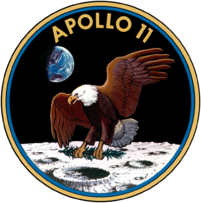 I so very much wanted to be there as Apollo 11 circled the Moon, the landing craft, EAGLE, dropping to the moon’s surface. When Armstrong first, then Aldrin stepped onto the Moon’s surface, I would loved to have been the third man. Heck, I’d even been thrilled to be Michael Collins back on Apollo 11. I remember discussions among friends and co-workers that summer. Most of them weren’t interested in being on board, something I didn’t get. Only one other expressed the same desires I did. And in the years since, Most of the country has gotten pretty blase about the Space Program. Even back then, by the time of Apollo 13, it was no longer getting the coverage on television. It took the drama of possible loss of life to get a rise from people. I didn’t understand it then or now. I still get that thrill with very shuttle launch. Forty-two years ago today, America completed President John F. Kennedy’s stated desire to beat Russia to the Moon. Only a few more times and we quit. A mistake I think. The link below contain Kennedy’s speech on the subject. \"We choose to go to the Moon…\"
A number of milestones coming up this year in humankind’s first early efforts to explore that last frontier. It’s a little late because of family emergencies, but I’m going with it anyway. I’m linking toDayton Ward\'s Blog, who does a much better job than I could telling it. Forty years ago today, man, an American, first stepped on the Moon. I wanted to post a few thoughts on that historic event. Here was the realization, somewhat, of all those SF stories I read at the time(I hadn’t yet broadened my horizons to encompass so many great books out there). I just couldn’t believe that some “would never set foot off the Earth!” I have one friend that is one of those who still maintain it was all faked. We only went to the Moon a few more times before we abandoned it because of a few thinkers who thought it all a waste of time when so much more could be done here on Earth with the money spent(think Walter Mondale for one). Every year, NASA’s budget gets cut even more. People just don’t realize the products that are taken for granted these days that were developed as a result of the space program. Dialysis machines, wwater purification systems, fire resistant fabrics, freeze dried foods, GPS systems that are in most new cars, and on and on. I think digital watches are in this group. If we had continued, we’d likely have a base on the Moon now and be preparing for further exploration of our Solar System. (sigh) I cab see now I’m never going to make it into space, which seemed a real possibility back in 1969.